So you want a (new) professional-level XLR microphone to record yourself speaking or singing? You’ll need to consider 2 main things: dynamic or condenser (I’ll explain which is better for your situation in a second) and what your budget looks like. The mics are listed in ascending order by price (they go from low to high). I also want to highlight that many of these microphones work great to record instruments and other sources of audio, but they excel for voice recording and podcasting. Looking for a USB microphone? Dynamic microphones are less sensitive than condensers, making them a great choice when recording multiple people in the same room or if you don’t have a quiet recording area. You will usually need to be very close to the mic as well. Live performers commonly use dynamic mics so they don’t pick up the other instruments as well. Condenser microphones are more sensitive and precise, making them a great choice when recording solo in a quiet environment. They require external or “phantom” power, which most decent digital audio interfaces have, but it’s something to be aware of. 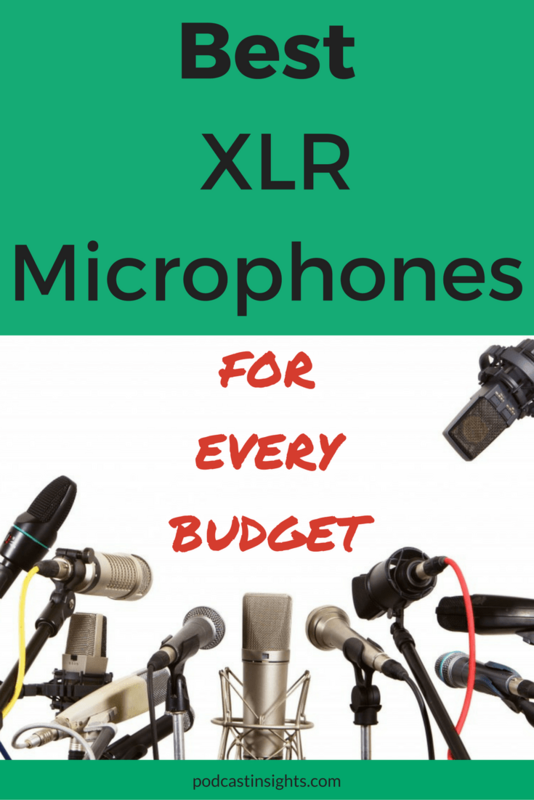 The XLR microphones we recommend range from under $70 to $500 (with one exception – check it out at the end of the post). When choosing an XLR microphone, you will also need a way to get the audio onto your computer for editing. Typically this is accomplished with a DAC (digital audio converter) like a USB interface or mixer. For dynamic mics or ribbon mics, I highly recommend the Cloudlifter CL-1 or CL-2 to give the signal a +25dB boost, just remember to get an extra XLR cable. Other common accessories are mic booms (also check out the best tabletop stands) and shock mounts. 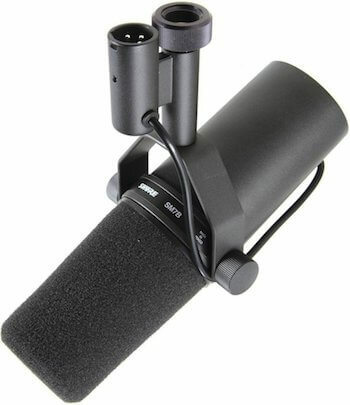 Usually, the company that makes the mic will also offer a compatible shock mount. We have various recommendations for XLR mic sets in the podcast starter kit if you just want to get everything together, but we’ll also suggest these options for each mic in the “pair with” section. You’ll want to consider the cost of all of these when choosing which mic to get. We’ve mentioned the ATR2100-USB a few times here on Podcast Insights. See the review here. It is an excellent budget-friendly dynamic cardioid microphone that gets a lot of praise. The dual USB / XLR outputs can be used at the same time, allowing you to get a backup recording. Audio-Technica even includes both a USB and an XLR cable. I’ve recommended the USB+ version of the AT2020 in other posts, this is the XLR version. It is a cardioid condenser microphone, ideal for solo recordings. There is also the AT2035 that runs about $50 more, but it comes with a shock mount and includes a switchable high-pass filter, 10dB pad, a higher SPL and more dynamic range. All of that makes the AT2035 an easy choice while still staying under $150. 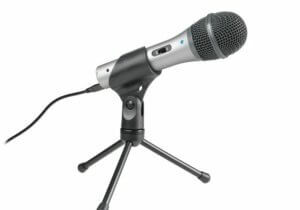 This is a hugely popular mic and many professional sound engineers recommend it. 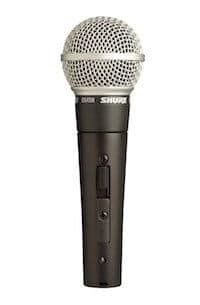 The Shure SM58 is a cardioid dynamic mic that is commonly used for live performances. The ‘S’ version includes an on/off switch. This microphone is made and tuned for vocals. If you want something that you will use for both studio and stage, the SM58 could be a great choice. 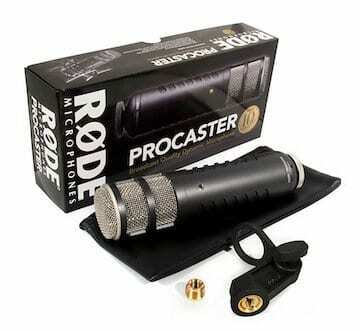 The Rode Procaster is an excellent near studio-grade alternative to some of the more “pro” level mics below. 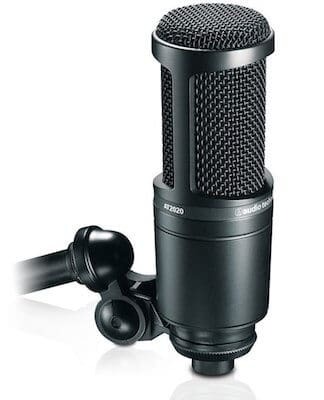 It offers a 75Hz – 18kHz frequency response, has an internal pop filter, and comes with a stand mount adaptor. If you don’t want to hold it in your hand (which is not recommended), you’ll need a stand or boom. The Procaster is a cardioid dynamic microphone, making it great for a 2-4 person studio so you don’t pick up each other speaking. The mic isn’t very “hot” so I highly recommend using a separate microphone preamp so you don’t have to raise your audio levels in post (which also raises your noise levels). An easy-to-use option is the Cloudlifter CL-1. 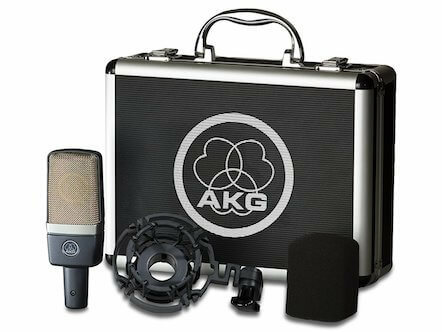 The AKG C214 is the cardioid-only version of the C414. It comes with the awesome-looking case, shock mount, and windscreen pictured above. The C214 is a condenser with a 1″ capsule that offers very warm and natural sound and it has a switchable 20dB pad for recording loud sources. 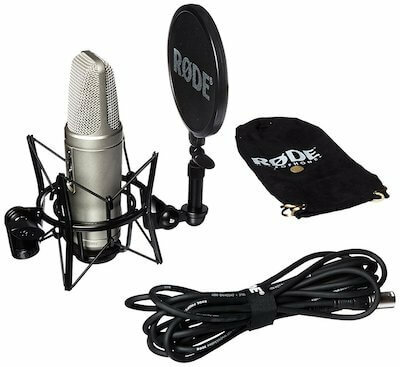 The included accessories make this one of the best deals for a condenser mic and you get amazing sound. You really can’t go wrong here. 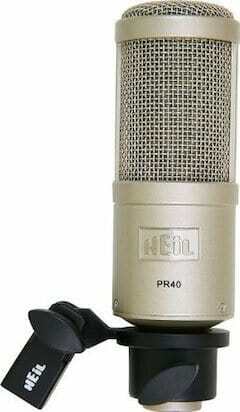 The Heil PR-40 is one of the most commonly recommended high-end XLR podcasting microphones, for good reason. It’s also used by many of the top podcasters. The PR-40 is an end-address dynamic cardioid mic with a frequency range from 28Hz to 18kHz (widest in the PR series), uses a large 1″ diaphragm that is internally shock mounted, and has an internal pop filter. You also get a padded leather case with a molded foam insert for easy and secure travel. Another thing to note is that the build dimensions match the EV RE20, so the PR-40 can use accessories for either mic. I really like the Telefunken Elektroakustik M82 and rarely see it mentioned. It was designed as a kick drum mic, but because of the EQ switches, you can use it for vocals and it easily competes with the other mics around the $400 price point. The Rode NT2-A will give you a lot more flexibility compared to most of the other XLR mics recommended here. It offers 3 different pickup patterns: omnidirectional, cardioid, and figure 8. You can set the High-Pass Filter to Flat, 40Hz or 80Hz. For loud sources, you can change the PAD from 0dB to -5dB or -10dB. The frequency response goes from 20Hz to 20kHz and it can be powered with both 24-volt and 48-volt phantom power. Many mics with similar capabilities cost twice as much or more, making this an amazing value for a variety of recording applications. The Shure SM7B is a standard in radio broadcasting, meaning it’s easily right at home for your podcasting studio. The SM7B is a dynamic cardioid mic with a frequency response from 50Hz to 20kHz. It’s designed to protect against electromagnetic static and hum generated from computers and lights. As you can see, it comes with a built-in windscreen and mounting bracket, and has a built-in “air suspension” shock mount. There is also an additional detachable A7WS windscreen. Because you basically get everything you need in one package, this is an excellent value, and equally great-sounding XLR microphone for podcasting. You will need a preamp with at least 60dB of gain, so I would recommend pairing it with the Cloudlifter for an easy volume boost to avoid introducing too much noise. Another standard in the broadcast industry, the Electro-Voice RE20 will not steer your wrong. 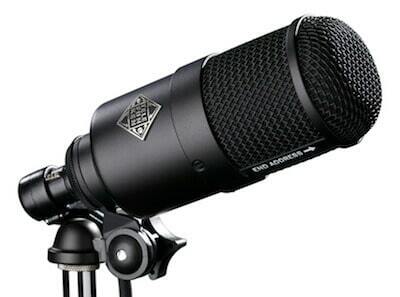 It’s a true cardioid dynamic mic that performs as well as any condenser. This thing was released in 1968 and you have probably heard people using it more than you realize. The unique Variable-D feature reduces the proximity effect and will forgive even inexperienced mic users from not speaking in the “perfect spot”. You’ll get a frequency response from 45Hz to 18Khz, an internal pop filter, an internal shock mount to reduce vibration noise, and a gentle bass roll-off (high-pass filter) switch. Similar to the other professional-level dynamic mics, you’ll want a microphone pre-amp to avoid excessive noise when you turn the gain up. A great option is the DBX 286s pre-amp. It’s an industry favorite that also gives you some additional compression, de-essing, and more. For an extra $50 when compared to the RE20, this is a solid upgrade. If you’re considering between either of these, get this one! 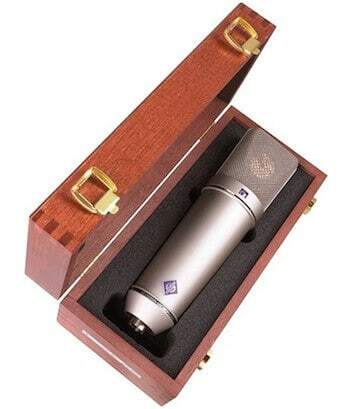 Lastly, but certainly not least, we have the Neumann U87. 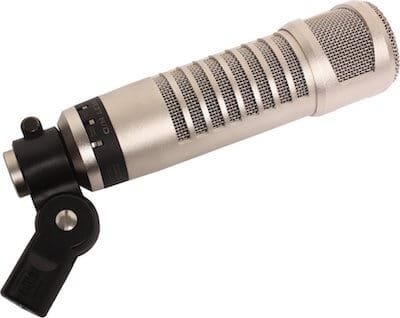 This mic is in a class of its own, with a price point to reflect that: over $3,000. It’s a multi-pattern condenser mic: omnidirectional, cardioid, and figure 8. You also get a -10dB attenuator and a low frequency roll-off. And yes, it comes in the wooden box shown above. It is designed to bring out warmth, especially for vocals and handles EQ exceptionally well. I wouldn’t recommend this unless you have a great preamp and a suitable studio. It’s definitely not for beginners.